Minister of Public Health, Volda Lawrence addressing overseas-based Guyanese in Washington DC. As 74 Guyanese nurses prepare to leave to take up job offers in the United Kingdom, Guyana’s Public Health Minister, Volda Lawrence announced in the United States (US) that government would be setting aside 30 acres of land to construct a nursing college to train local and Caribbean health care personnel. 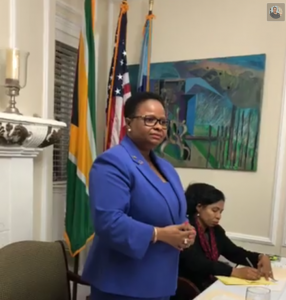 Addressing overseas-based Guyanese in Washington DC where she was attending an international conference of health ministers, Lawrence said Guyana and the rest of the region should cease lamenting the impact of the brain drain of nurses. Instead, she believed that nurses should be trained for the international job market to increase foreign exchange remittances. “I said to them that this is not something to complain. You got to fix it. If they want our people, let us train them and send them out so we could get forty Western Unions in our countries instead of ten so that we can exchange human resources and get back the monies into our country. We have to find a way; we just can’t complain,” she said. The 74 nurses are due to leave for London in October and November, 2018. The Public Health Minister said the Guyana Lands and Surveys has promised to allocate 30 acres of land ahead of preparations for the 2019 National Budget for the construction of a nursing college and hospital in the vicinity of the proposed East Coast-East Demerara road. “We believe in that way we can be able to attract not only Guyanese but also students from the Caribbean. That in itself will also help us at the economic level because they must need somewhere to stay, they got to eat and so on so we are looking at that and hoping that we can be able to train more nurses than we are doing now,” she said. 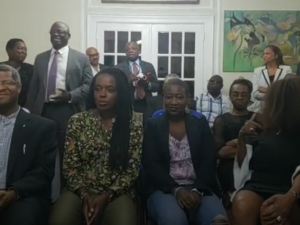 The College is expected to be staffed by 13 Guyanese nurses, who were recently sent to Brazil to pursue Masters and Doctorates for the first time in the Caribbean. Overseas-based Guyanese in Washington DC. listening to Minister of Public Health, Volda Lawrence. Currently, nurses are trained at the Georgetown School of Nursing, Charles Rosa School of Nursing in Linden, St. Joseph Hospital Nursing School and the University of Guyana. Several overseas-based Guyanese publicly pledged to assist in health education, business and finance, and the reduction of the prevalence of HIV/AIDS. Amendments to the 1947 Nurses and Midwives Act, Lawrence added, would be tabled in the National Assembly to allow nurses to specialise. “Many of our nurses are excellent at what they do but they are so demotivated because they don’t see the hope of moving anywhere,” she said. Lawrence also announced that an international nurses exchange programme would be re-established in collaboration with the United Kingdom, United States and Canada. The Public Health Minister praised the young doctors, who are conducting research voluntarily, and said more monies would be allocated to fund more such research. She noted that the Guyana government could not afford to pay super salaries on its own, except in the case of foreign-funded projects. At the same time, she noted that the foreign experts initially experience difficulties communicating with Guyanese.